Acute Back Pain: Acute low back pain, lower back pain or neck pain generally lasts less than six months. A few cases may resolve without medical attention, although many reoccur. Annulus Fibrosus (an-U-lus, fi-BRO-sus) ­ The thick fibrous outer ring of the intervertebral disc that surrounds and encloses a gelatinous or jelly-like substance (nucleus pulposus) in the center of the disc. It provides support and stability to the disc. Bulging Disc ­ A broad-based extension outward of the intervertebral disc in one or all directions. In a bulging disc, the fibrous outer ring (annulus fibrosus) of the disc and vertical ligament in the back of the spinal vertebrae (posterior longitudinal ligament) are both intact but can be weakened. This often results from pressure on the disc caused by activities such as lifting heavy objects and straining the back or neck. Chronic Back Pain: Chronic low back pain, lower back pain or neck pain generally persists beyond six months. If you are experiencing chronic back pain or chronic neck pain, you IDD Therapy® may be an appropriate treatment for you. Coccyx: Two to four tiny, partially fused vertebrae at the end of the sacrum. Degenerative Disc Disease (Disc Degeneration) ­ A shrinking or narrowing of the disc space often accompanied by bony spurs on the vertebra known as osteophytes. Degeneration of the disc over time produces low-grade inflammation and irritation and is a major cause of chronic low back pain. Because the discs in the spine do not have a dedicated blood supply, the discs must rely on a process called diffusion to receive their supply of water, nutrients, and oxygen. If the flow of these elements is disrupted, the vertebral discs can degenerate. Disc degeneration can be mild, moderate or severe. Disc (Intervertebral Disc) ­ The tough, elastic structure that is between the bodies of spinal vertebrae. The disc consists of an outer annulus fibrosus enclosing an inner nucleus pulposus. The discs serve as cushioning between and shock absorbers for the spinal vertebrae. Extruded disc or Extrusion ­ This refers either to an leakage of part of the soft, gelatinous central portion (nucleus pulposus) of the intervertebral disc through a defect in the fibrous outer ring (annulus fibrosus), a piece of the annulus fibrosus that is torn away and hanging off of the disc or both. This often results in pain that can be localized or may extend into the leg and buttock causing sciatica. Facet or Facet Joint (fuh-SET) ­Each spinal vertebra contains two upper (superior) and two lower (inferior) facets along the back arches of the bone. The facets are the sites where the adjacent vertebra above and below connect with a single vertebra. This connection forms the facet joint that allows motion in the spinal column. Facet Syndrome ­ This is a condition where there is degeneration and/or inflammation of the facet joint leading to pain and some subsequent immobility at the specific facet joint or spinal vertebral region. Foramen or Foramina ­ A natural opening or passage in bone. In the spine, these are termed neural foramina or neuroforamina. They are canals formed by the union of two adjacent facets. These canals allow for the passage of the spinal nerve root and spinal nerve as it travels from the spinal cord to the rest of the body. Herniated Disc ­ The local protrusion of disc material resulting from a tear in the outer fibrous ring (annulus fibrosus) of the disc. This allows for part or all of the soft, gelatinous inner portion (nucleus pulposus) of an intervertebral disc to escape from its center causing a flattening of the disc (loss of disc height), decreased shock absorbing and cushioning function and a chemical irritation of the spinal nerve root resulting in pain. This pain can be localized or may extend into the leg and buttock causing sciatica. Pain from a herniated neck disc may spread into the shoulders or arms. Extension of pain into the arms or legs may be associated with radiculitis or radiculopathy. Herniated Disc in the Cervical (Neck) Spine ­ There are seven vertebrae in the cervical spine (neck), referred to as C1 to C7. The statistics regarding herniated disc in the neck are approximately: C6-7 (69%), C5-6 (19%), C7-T1 (10%) and C4-5 (2%). Herniated Disc in the Lumbar (Low Back) Spine ­ There are five vertebrae in the lumbar spine (lower back), referred to as L1 to L5. The statistics regarding herniated disc in the low back are approximately: L4-5 (35%), L5-S1 (27%), L3-4 (19%), L2-3 (14%) and L1-2 (5%). IDD Therapy® ­ IDD Therapy® or Intervertebral Differential Dynamics Therapy® is a proven non-surgical, non-invasive treatment for the relief of lower back pain and neck pain. It is an innovative approach effective in treating herniated discs, bulging discs, degenerative disc disease, posterior facet syndrome, sciatica and acute or chronic neck and back pain. It is a safe, painless and comfortable treatment found to be 86% to 92% successful in relieving lower back pain and neck pain symptoms. Inflammation ­ The result of localized injury or damage, which starts a cascade of responses leading to swelling (edema), warmth, red color (erythema) and pain in the area. Inflammation triggers the pain receptors (nociceptors) leading to both acute pain and chronic pain. Intervertebral Canal ­ A passageway for the spinal nerve root formed by the joining of two adjacent vertebrae at their facet joints. This allows nerve fibers from the spinal cord to reach the rest of the body. 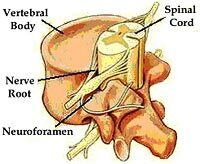 It is also called an intervertebral foramen, neural foramen or neuroforamen. Intervertebral Disc ­ See Disc. Intravertebral Foramen ­ A canal formed by the bony arches on the back of the vertabrae through which passes the spinal cord. The intravertebral foramen of all the vertebrae form the length of the spinal canal. Ligament ­ A band of flexible, fibrous connective tissue that is attached at the end of a bone near a joint. The main function of a ligament is to attach bones to one another, to provide stability of a joint, and to prevent or limit some joint motion. Lordosis ­ This is the normal backward curvature of the spine in the region of the neck and low back. An increase or decrease in the natural lordotic curve of the lumbar (low back) or cervical (neck) spines is often abnormal. Lumbago or Lumbalgia ­ Terms used to specify pain in the lumbar region of the spine. They are synonymous with low back pain or lower back pain. Lumbar ­ The lower part of the spine, located between the thoracic spine (midback) and the sacrum (tailbone). The lumbar spine consists of five vertebrae, named in sequence from top to bottom as L1 through L5. The lumbar spine supports most of the body's weight and absorbs large amounts of stress. Nerve Root ­ An extension of the nervous system from the spinal cord, within the spinal canal, to the rest of the body. There are two spinal nerve roots and spinal nerves that exit from the sides of the spinal cord through the vertebral neural foramina at each vertebral level. These nerves travel on to innervate the arms, legs and remaining body structures. Nucleus Pulposus (NOO-klee-us, puhl-PO-sus) ­ The semi­gelatinous tissue in the center of an intervertebral disc. It is surrounded by and contained within the annulus fibrosus, which prevents this material from protruding outside the disc space. Osteophytes ­ Bony spurs or outgrowths of the bone resulting from wear and tear. These bony growths may or may not irritate the surrounding tissue or nerves causing inflammation and pain. Osteophytes and osteophytic growth are generally associated with Osteoarthritis. Piriformis Syndrome – A group of symptoms that begin as a result of spasm in the piriformis muscle, which compresses or irritates the sciatic nerve causing pain down the leg, usually as far as the knee. The piriformis muscle is located in the gluteal region and helps rotate the hip out to the side. The sciatic nerve runs beneath the piriformis muscle as it exits the pelvis to enter the leg. This syndrome is treatable with osteopathic manipulation and stretching exercises. Radiculitis ­ Inflammation of a spinal nerve root in the area between the spinal cord and the intervertebral canal. This is usually associated with a bulging or herniated disc. Radiculopathy ­ Disease or compression of the nerve root leading to serious neurological problems with symptoms such as pain, numbness or tingling in a leg or legs. Ruptured Disc ­ See Herniated Disc. Sacrum ­ The sacrum is a triangular bone consisting of five fused vertebrae that have no intervertebral discs. Its forms the base of the spinal column and the keystone of the pelvis. It is also known as the tailbone. The sacrum is joined above with the lumbar spine at L5 forming the lumbosacral junction and the two hip bones (ilia) on either side forming the left and right sacroiliac joints. 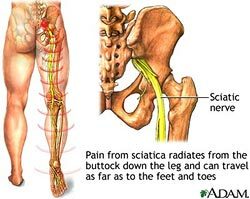 Sciatica ­ Sciatica refers to a pain felt along the length of the sciatic nerve. The pain is usually felt in the buttock and spreads down the back of the leg to below the knee and sometimes down to the foot. Sciatica is one of the most common forms of pain caused by compression of the spinal nerves. The leg pain is often much worse than the back pain. It is estimated that up to 40% of people experience pain caused by compression of this nerve at some point in their lifetime. The six most common causes of sciatic nerve compression are: (1) a bulging disc or herniated disc (2) lumbar spinal stenosis (3) spondylolisthesis (4) trauma (5) piriformis syndrome, and (6) spinal tumors. Sciatic Nerve ­ The sciatic nerve is the largest and longest nerve in the body. It originates from five separate spinal nerves (L4-S3), which join together to form a single nerve called the sciatic nerve. This nerve passes through the sciatic foramen in the gluteal area to the rest of the leg. In the leg, the nerve separates in to a number of branches. The nerve and its nerve branches enable movement (motor function) and feeling (sensory function) in the entire leg and foot. The sciatic nerve may sometimes be compressed by the piriformis muscle as it exits the pelvis to enter the leg. Scoliosis ­ Sideways (lateral) curvature of the spine. Spinal Stenosis ­ Narrowing of a space in the spine that part of the nervous system travels through. This results in compression of the nerve roots in the neural foramen or spinal cord in the spinal canal by bony spurs, a bulging disc or a herniated disc. This occurs most often in the lumbar spine (low back) but also occurs in the cervical spine (neck) and less often in the thoracic spine (middle back). Spinal stenosis is most often caused by degeneration of the discs between the vertebrae due to osteoarthritis. Spinal Disc ­ See Disc (Intervertebral). Spinal Column ­ See Spine. Spinal Canal ­ The long bony channel formed by the intravertebral foramen of all the vertebrae in order to house and protect the spinal cord and nerve roots. Spinal Cord ­The spinal cord is the central trunk of nerves that connects the brain with the rest of the body. It is enclosed in the spinal canal. Each nerve root passes from the spinal cord to the body through small openings (foramen) bounded on one side by the disc and the other by the facets. When the spinal cord reaches the lumbar region, it splits into four bundled strands of nerve roots called the cauda equina (meaning horsetail in Latin). Spinal Fusion ­ A surgical procedure to permanently connect two or more vertebrae in order to prevent motion. Spine ­ The flexible bony column extending from the base of the skull to the tailbone. The spine is the central support structure of the body's bony framework. It is made up of 33 bones, known as vertebrae. The first 24 vertebrae are separated by intervertebral discs and are bound together by ligaments and muscles. Five vertebrae are fused together to form the sacrum and 4 vertebrae are fused together to form the coccyx. There are four regions of the spine, the cervical spine or neck, thoracic spine or midback, lumbar spine or low back and the base of the spine in the pelvic area. The spine is also referred to as the vertebral column, spinal column, or backbone. Spondylitis ­ Inflammation of the vertebrae. Spondylolisthesis ­ The forward displacement of one vertebra on another caused by a defect in the bone between the superior and inferior facets. 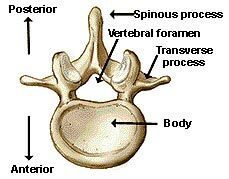 The vertebra with the defect and the spine above that vertebra are slipped forward in relationship to the vertebrae below. This condition can vary in degree of displacement. It is usually due to a developmental defect or the result of a break in one or both of the bony arches in back of the vertebra. 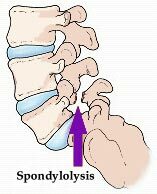 Spondylolysis ­ Displacement of one vertebra over another associated with a break in the back arch of the vertebra. This results from a defect in the arch between the superior and inferior facets of the vertebrae. It may be one-sided or occur on both sides and is usually due to a developmental defect but may be due to a fracture. Spondylosis ­ Degenerative changes of the vertebrae, vertebral joints, intervertebral discs or the surrounding ligaments, mainly due to osteoarthritis. This leads to stiffness and may cause pain, numbness or tingling in the arms or legs. Vertebra ­ One of the 33 bones of the spinal column. A cervical, thoracic, or lumbar vertebra has a circular body in front and two arches behind (composed primarily of the laminae and pedicles as well as the other structures). Together these structures form a canal that houses and protects the spinal cord as it descends from the brain to the tailbone. The plural of vertebra is vertebrae.